January was my favourite month from 2012 because I got to see the amazing One Direction live! I’m sure most of you know I am crazy about One Direction, I love them and I was lucky enough to go with my boyfriend Harry (I made him come with me). I can’t believe how lucky I was to get tickets, they sold out in 12 seconds on the site I got them from which makes me think wow how the hell did I get some. In February I turned 16 and I had my closest friends round for a little party, I can hardly remember it as I had a bit to much alcohol, naughty me, but I can remember having a laugh with my best friends. It looks more like a Halloween party but it’s not, I love horror films so the theme was horror. On the 29th of March I went to another concert, woo! This time it was to see my idol, Cher Lloyd. I can’t wait till she does another tour so I can go again, it really was a brilliant night. I went with Harry and our good friend Skye. The Pomeranian dog is my mum and nans dog Halle, we half own her as she lives at my nans most of the time and sometimes here if my nans in hospital. I also spent a lot of the summer with my friends, we are the maddest most random bunch of people you will meet, we’re the group of people you look at and think what the hell is wrong with those loons haha, but we know how to have a laugh. There’s a random picture of us on the train in masks, we actually went the whole journey and the walk to the beach looking like this. 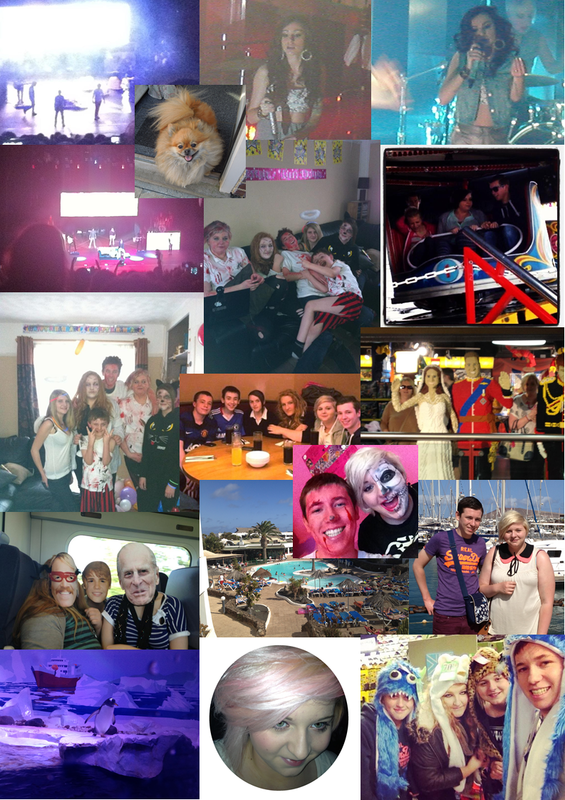 In August I went to Lanzarote with Harry and his mum and dad so there is a few pictures from that in the collage. We had such a lovely time and I really got to spend quality time with Harry as we had our own apartment together and his mum and dad had an apartment on the floor above.